Try making these Cream Scones With Chocolate, they are such a fantastic in-between meal treat! To avoid leaving a mess, use a large bowl to mix all the six ingredients together and I am sure you will be pleased with the end result. Be prepared to get lots of compliments! 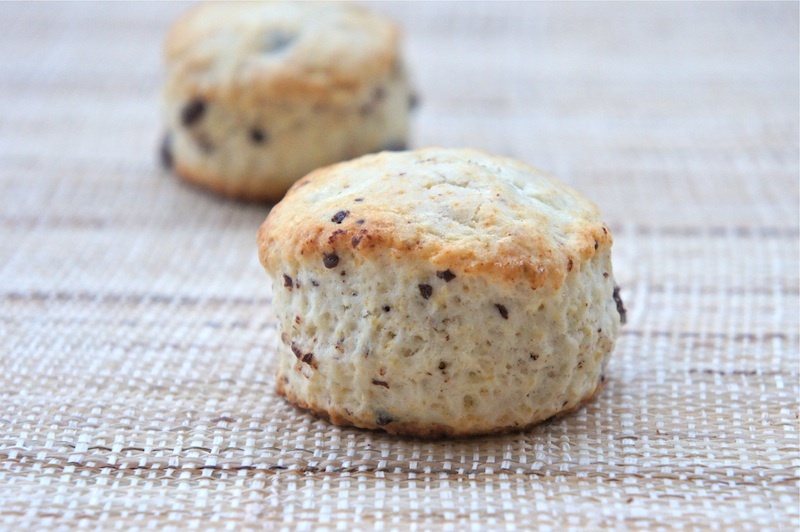 The scones have a lovely crisp crust, light and soft texture inside, and very chocolaty! With the rack in the middle position, preheat the oven to 425˚F (220˚C). Line a cookie sheet with 2 layer of parchment paper. In a large bowl, combine the flour, sugar, baking powder, and sea salt. Mix the dry ingredients well with a whisk. Stir in the chocolate and make a well in the center and pour in the cream into it. Use a rubber spatula to push the dry ingredients from the sides of the bowl into the well, cutting and turning the mixture just until the dry ingredients are almost entirely moistened and the dough looks rough and shaggy. Gather the dough into a lump and knead it gently against the sides of the bowl five or more times, pressing in the loose pieces, until the dough just holds together (it should not be smooth) and the sides of the bowl are fairly clean. On a lightly floured surface, flatten the dough with your hands or roll out to about 3/4 inch (2 cm) thick. Using 2 inch (5 cm) round cookie cutter, cut the dough into rounds. Arrange the rounds on the baking sheet, leaving space between each one. Brush the tops with cream and bake until golden brown, 12 to 15 minutes. Let cool on a rack, and serve warm or at room temperature. First time came across a scone recipe without loads of butter! This I must try! Thanks for sharing! I made some lovely chocolate scones which were just sensational. These look perfect too. Love the addition of whipping cream. What a perfect companion to a cup of hot coffee. Hi Angie, if I were to bake these the night before and bring them to a meeting the next morning will they still taste good? Thanks. @KY: Yes, the scones still taste good the next day. Hi Angie!! The scones looks nice, and cream yum.. chocolate.. double yum!! 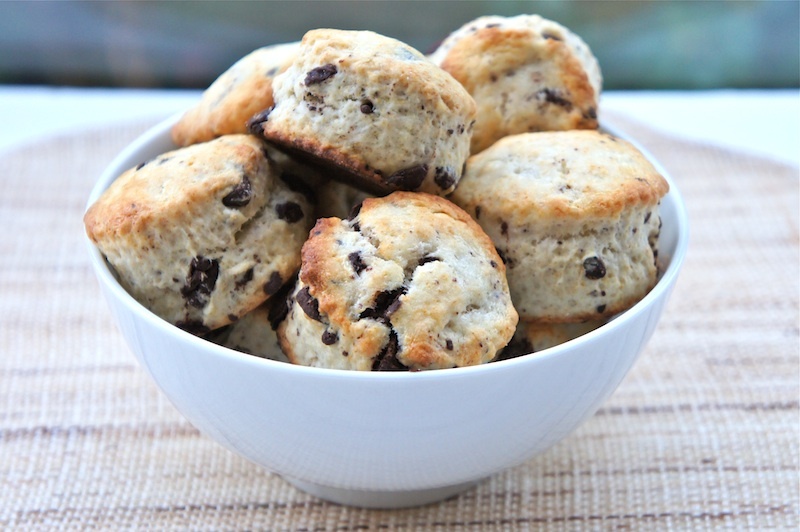 Chocolate-flecked scones sound delightful! Especially ones made with all cream -- one of my favorite ways to go about scone-ing. Might have to try this one soon. Those sound really yummy and easy! Oooo! Those look so delicious! Ooooh, this looks so delicious! Gonna make this one for sure..
yum, I love waking up, knowing there are scones to eat from breakfast! ...especially ones with chocolate... These look great! Your scones looks gorgeous! I was wondering whether it possible to substitute chocolate chips with any other dried fruit or can it be done just plain? i tested this recipe out and they were so creamy and delicious! the butter was not missed! well...im going to try this once....hp it wrks out.cz kitchen isnt meeee!!!!!! Made these on a lazy Sunday afternoon and they were so easy to make! Thanks.